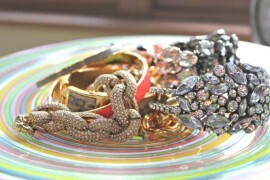 They say diamonds are a girl’s best friend- but why limit your options? Pearls, gems and beads should all be in a woman’s arsenal of fantastic accessories. With so many pieces to keep track of, a brilliantly designed jewelry organizer is the perfect way to store them in style. 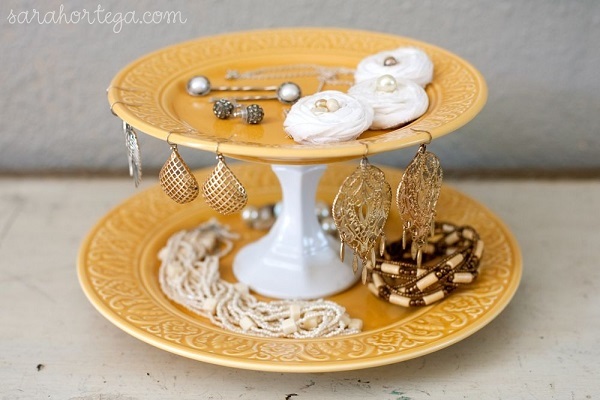 Looking for ways to organize your own accessories? 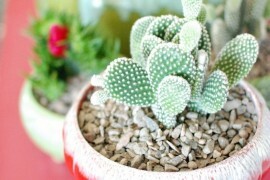 Here are some DIYs that will get you started. 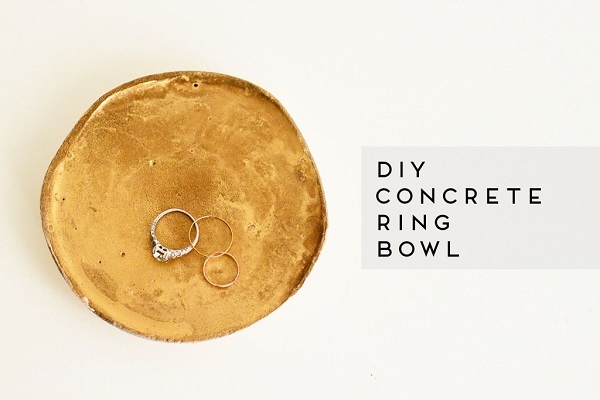 While small in size, organizing your rings will make getting ready a breeze. 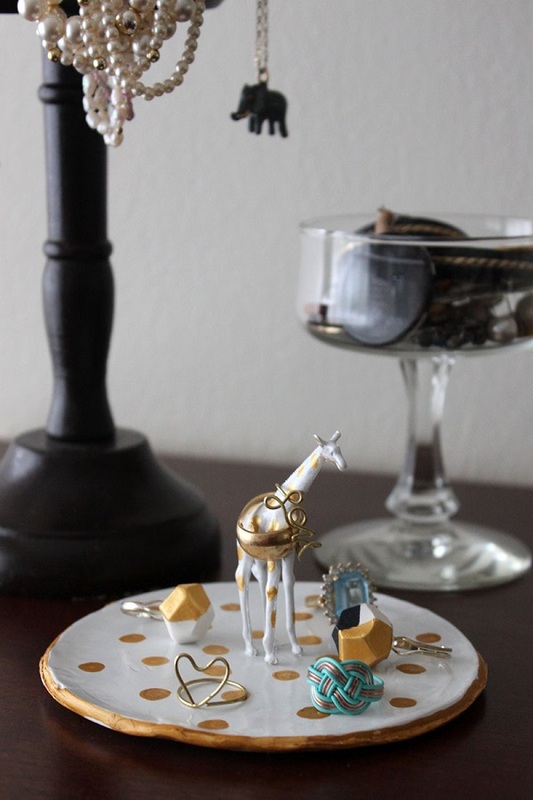 This adorable giraffe ring dish by Luisa of Why Don’t You Make Me will make reaching for your favorite piece a treat. Create the base using polymer clay and attach a giraffe figurine for a mini ring tree. If you decide to use another animal, choose one with long limbs or tails for easy storage. An elephant or flamingo would make nice substitutions. 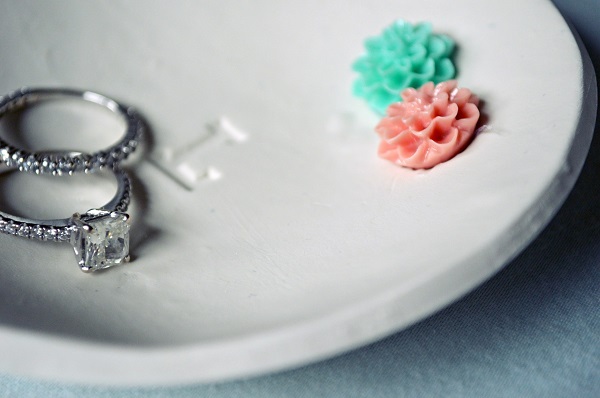 A ring dish gets a personalized touch with this DIY by Laura of Some Kind of Lovely Bride. 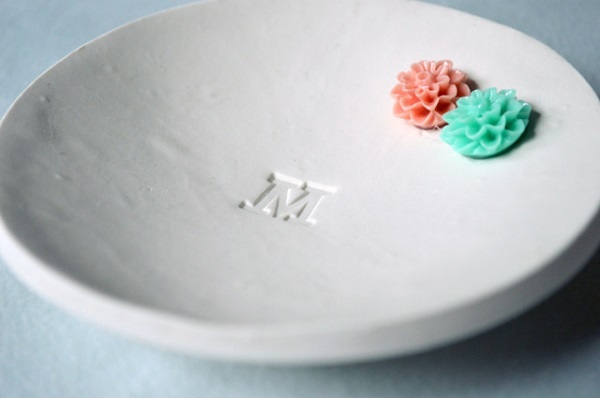 Also made out of an oven-baked clay, the simplicity of this project gains a sweet touch with an understated initial in the center. 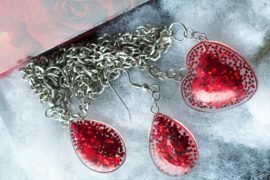 Make one for a thoughtful gift, or display on your dresser or table for an elegant feel. 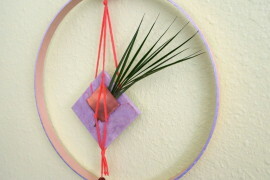 Namrata of Land of Nam created a beautiful dish out of an unlikely material- concrete. 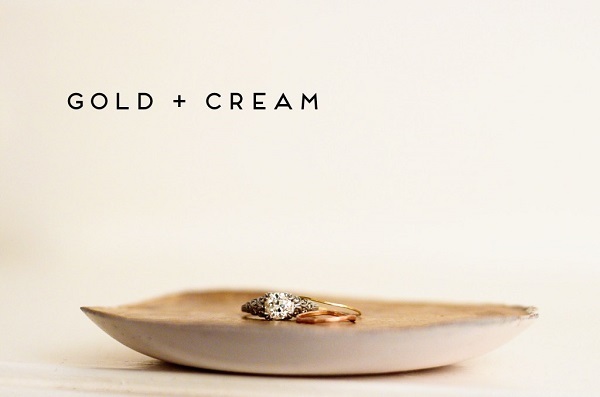 The imperfect surface coated in gold paint makes a sophisticated resting place for your favorite rings. 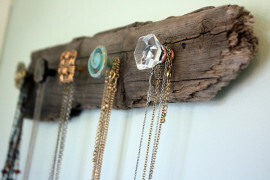 This wooden peg necklace hanger by Jesse of Well It’s Okay is a creative spin on the ombre decor trend. The gradient of blue hues make a huge visual impact against dark stained wood and a white wall. When mixing your shades, paint a stroke side by side to make sure the colors fade to your liking. Don’t tuck away your favorite pieces in a drawer. Put them on display with this shadow box DIY from Martha Stewart. 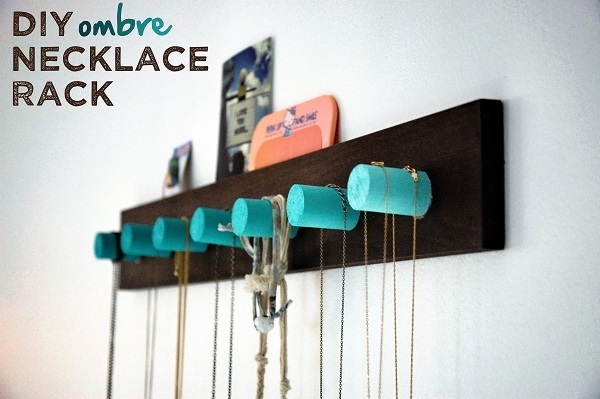 Your jewelry organizer can double as unique wall art- just attach hooks to the back of a premade box and hang. 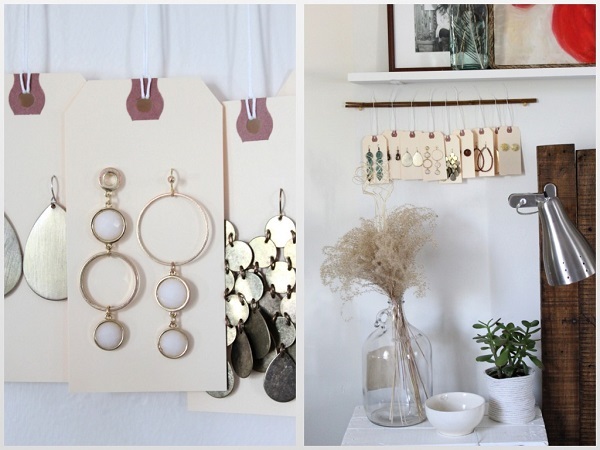 This earring holder by Katy of Rice Designs makes shipping labels look so chic! If you’re looking for an organizer that takes care of earrings with and without backs, this one is ideal. 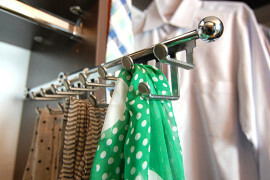 Hang the rack by your makeup vanity or dressing area for easy access when you get ready. Plates are no longer reserved for the kitchen! 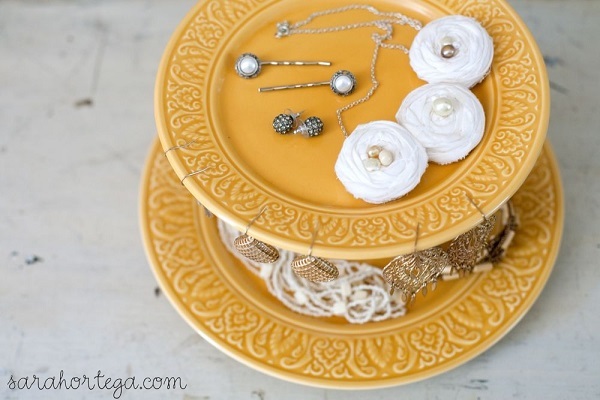 This cake plate DIY by Sarah of Sarah Ortega takes the food display to a new level with the help of pretty jewelry and charming fabric rosettes. 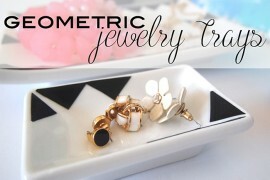 Hang backless earrings off the sides of the top plate and sit rings and bracelets inside for a well-organized jewelry system. 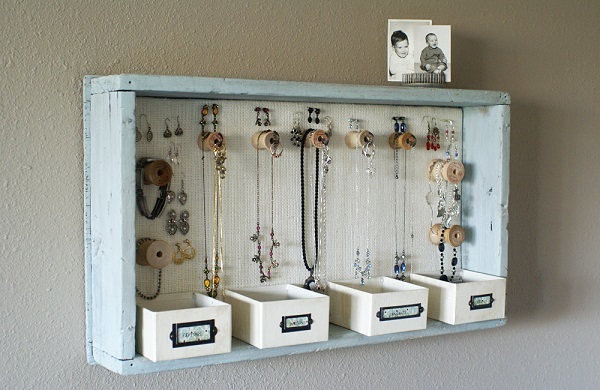 Melissa of A Time for Everything created a charming, repurposed jewelry organizer out of a dresser drawer and thread spools. 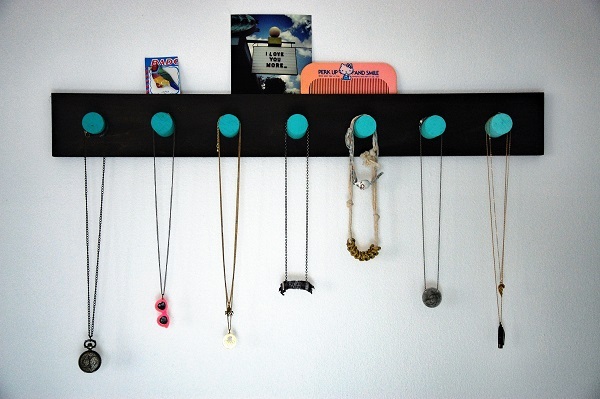 This hanger is perfect for organizing necklaces, bracelets, and earrings- plus you can use small bins for hairpins and rings. This organizer is a space-saving wonder. 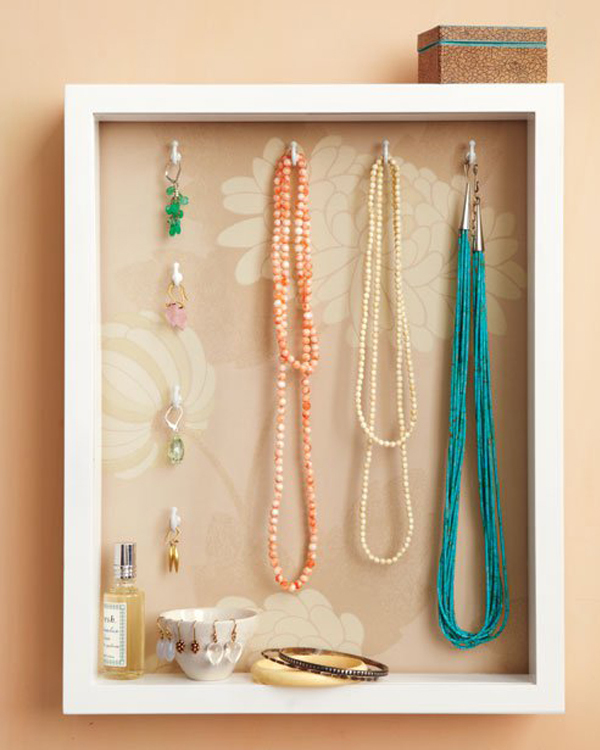 With these stylish organizing solutions, tangled jewelry will be a thing of the past! With so many options to choose from, you can easily fill an entire room with lovely organizers. 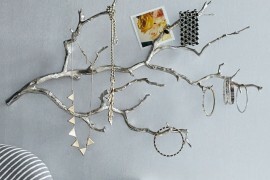 Inspired by one of these chic organizers? Tell us which project is your favorite in a comment below.